Holy Heartwarmer! No One Can Seem To Get Enough Of Batkid : The Two-Way The little caped crusader has won many hearts. Five-year-old Miles Scott, a.k.a. Batkid, has battled leukemia and archcriminals. Fans continue to marvel at the feel-good time that was had in San Francisco as he got his wish. 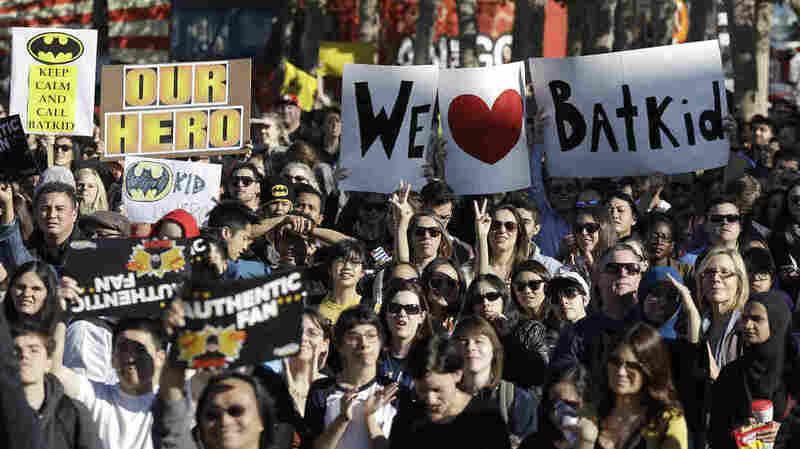 The little cape crusader's fans were out on Friday in San Francisco. One day after San Francisco was turned into Gotham City so that a little boy who battled leukemia could fight off some archcriminals, fans still can't seem to get enough of Miles Scott, a.k.a. Batkid. Just explore #batkid on Twitter and you'll see what we mean. All the #batkid stuff has me tearing up with joy at random moments all day today. The news networks also can't leave the story alone. Fox News: Batkid saves the day! Meanwhile, our friends at KQED remain on the case of the Make-a-Wish day that has the nation talking. We could go on. But the guy many want to hear from, of course, is Batkid himself. KGO-TV in San Franciso had an exclusive chat with the crime fighter and his parents.